Your little bundle of joy can cost a bundle. 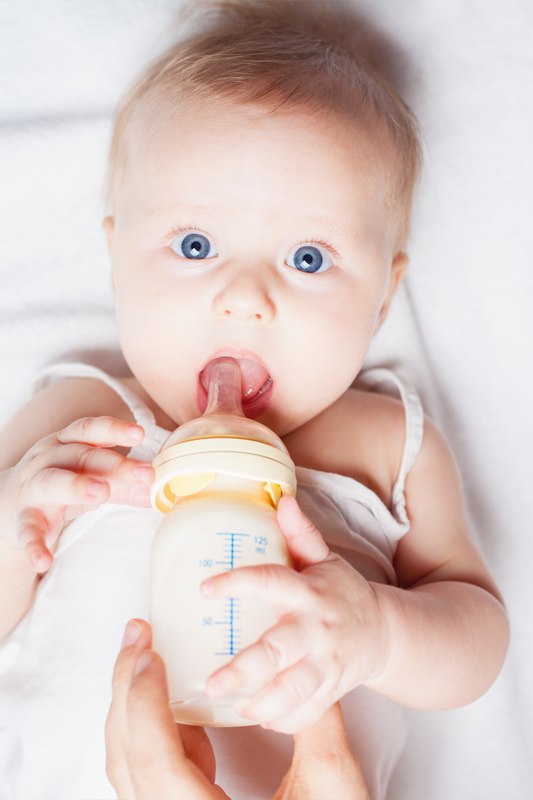 Here are 3 simple ways to save on formula. Whether it’s your first or your last, having a baby is full of precious moments you’ll cherish for a lifetime. But, it’s not all chubby-cheeked smiles and tummy time, y’all. It’s also a very expensive time. Between everyday baby expenses and unexpected purchases, that little bundle of joy can cost a bundle, too, especially during their first year. But, there are ways to save. 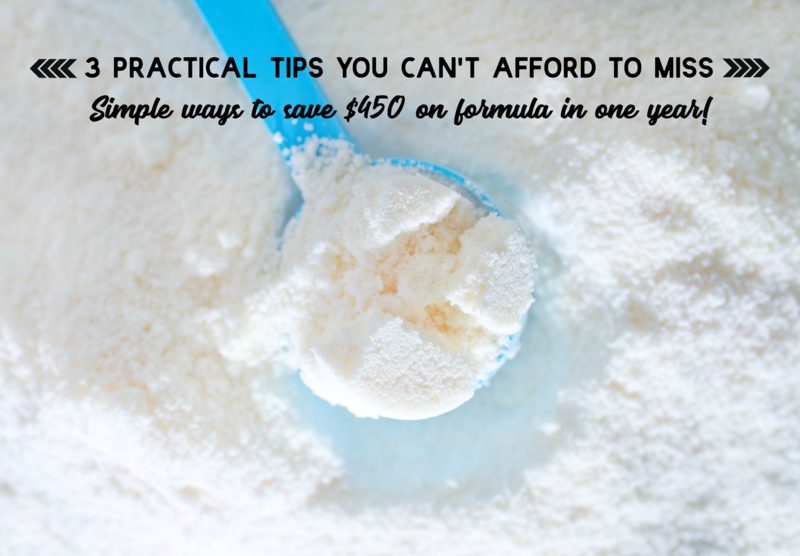 In fact, here are 3 simple ways to save on formula in a year. Shop at a mass merchandiser. I know that buying in bulk doesn’t always save you money, but when it comes to baby formula, it can actually save you big bucks. It’s really simple to do the math to see the cost per ounce. While you may only see a few cents savings per ounce, when you add up those few cents per ounce, you will find that over the course of a year you could see a $450 savings. Stick with powder, it’s cheaper. There are different types of formula you can buy. There’s powder, premixed (RTF), and concentrate. While premixed and concentrate may be easier and less work for you, it’s more work for the manufacturer and therefore you pay a higher premium. Powder is the cheapest because it’s cheaper to make so the savings is passed on to the consumer. Store Brand is the way to go. I think sometimes we have this false idea that somehow we are sacrificing quality when we purchase the store brand. There’s this inner battle of do we sacrifice our budget or do we sacrifice quality. The good news is that with Member’s Mark formula from Sam’s Club, you don’t have to sacrifice either. Member’s Mark Formula from Sam’s Club offers the same high-quality ingredients as national brands and is also non-GMO. The formulas are clinically proven to be as well tolerated as the advertised brands. Member’s Mark Formula meets FDA standards and is nutritionally comparable to advertised infant formula brands. Each of the formulas – Infant, Gentle®, Sensitivity®, and Advantage® 1 – offers everything your baby needs for that important first year. Armed with the knowledge that you don’t have to sacrifice quality ingredients or your budget, you are free to spend the money (and time) you’ve saved on what matters most: enjoying the priceless moments of motherhood and creating new memories with your little one. I know for us $450 goes a long way. What would you do if you had an extra $450? I always say that knowledge is power. You can learn more about Member’s Mark Formula to see that you are getting the same quality nutrition from national brands, but at a fraction of the cost of national brands. Also, until the end of the year, you can earn extra Kicks on Shopkick by purchasing Member’s Mark Formula. Wanna win? 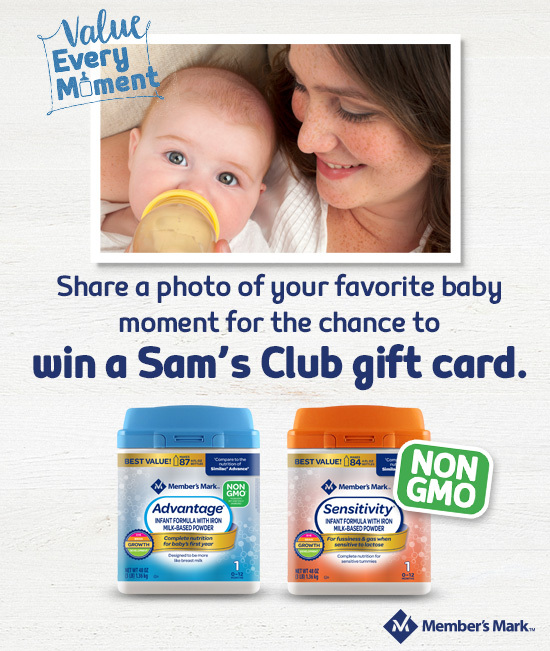 Enter the Member’s mark & Sam’s Club Value Every Moment Sweepstakes by submitting a photo of you and your baby experiencing a valuable moment, be it funny or heartfelt, for a chance to win a $500 Sam’s Club gift card or one of (10) $100 Sam’s Club gift card! Good luck, everyone! Oyy I don’t miss buying formula! It can be crazy expensive. Good to know about this option, I’ll pass this info on to my friends who are expecting. This is such great tips and advice. We have 2 more months of formula to go with this one! Agree that formula can be insanely costly. I remembered it so well. Good luck to those who entered! I’m sure anyone with a baby on formula will appreciate your tips on saving money. It’s such an expensive time for a family and every penny counts! These are awesome tips. I remember when my daughter was a baby. I thought I was going to have to get a second mortgage just to pay for all of that formula! Just kidding. But it WAS expensive. I remember how expensive formula was from when my boys were babies 18 years ago and more. it’s great to see an alternative to higher price national brands now. Oh boy I do remember the days. It was very expensive when I supplemented and that was a long time ago. I can only imagine how it’s gone up. Tips to save are good! This is such good information for families who use formula! I remember how expensive it was with my first child. I am so happy that I am past this phase of parenting. Great tips! I need to make sure to bookmark this for my daughter who is now expecting her first baby. Boy, I do remember how expensive formula was back in the day! I do agree powder is much cheaper. These are some great tips for saving money on formula. It has always been incredible to me how expensive it continues to be. I agree, buying in bulk or in mass will cost less expensive and you dont have to go to the store all time. Its not only saving money but saving time as well.